How to apply for Bank of Baroda Specialist Officers 2018 recruitment: BOB SO 2018 Recruitment Alert: Apply for 913 posts via bankofbaroda.com . 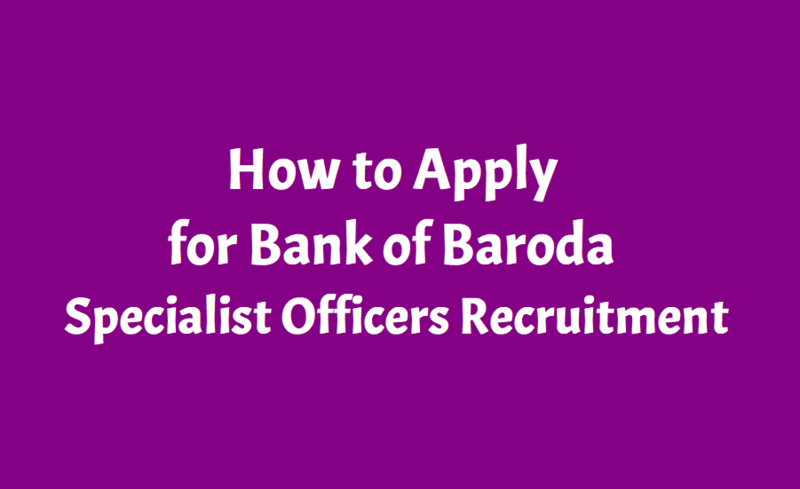 Bank of Baroda (BOB) has invited applications to fill up Specialist Officer posts. The Bank will fill 913 posts of Specialist Officer. Candidates who want to apply for the post can visit the official site of BOB at bankofbaroda.com. The last date of application for the position is December 26, 2018. Candidates will have to pay Rs 100/- if belonging to SC/ST/Persons with Disability and Rs 600/- for General/OBC category. Candidates will be able to apply on online mode. Candidates can check the age limit and other details if needed from the official notification available here or candidates can directly refer the official site of Bank of Baroda. The following documents in original together with a self attested photocopy in support of the candidate’s eligibility and identity are to be invariably submitted at the time of interview failing which the candidate may not be permitted to appear for the interview. Non submission of requisite documents by the candidate at the time of interview will debar his candidature from further participation in the recruitment process. v. Individual Semester/Yearwise Marksheets & certificates for educational qualifications including the final degree/diploma certificate. Proper document from Board/ University for having declared the result on or before 05.12.2018 has to be submitted. ix. An Ex-serviceman candidate has to produce a copy of the Serivce or Discharge Book alongwith pension payment order and documentary proof of rank last / presently held (substantive as well as acting) at the time of interview. Those who are still in defence service should submit a certificate from a competent authority that they will be relieved from defence services, on or before 05.12.2018.
x. Candidates serving in Government / quasi govt offices/ Public Sector Undertakings (including Nationalised Banks and Financial Institutions) arereq uired to produce a “No Objection Certificate” from their employer at the time of interview, in the absence of which their candidature will not be considered and travelling expenses, if any, otherwise admissible, will not be paid. xi. Persons eligible for age relaxation under 1.2 (5) must produce the domicile certificate at the time of interview/ at any stage of the subsequent process from the District Jurisdiction where he / she had ordinarily resided or any other authority designated in this regard by the Government of Jammu & Kashmir to the effect that the candidate had ordinarily domiciled in the State of J&K during the period from 01.01.1980 to 31.12.1989.
xii. Persons eligible for age relaxation under 1.2 (6) must produce a certificate from the District Magistrate to the effect that they are eligible for relief in terms of the Rehabilitation Package for 1984 Riot Affected Persons sanctioned by the Government and communicated vide Ministry of Finance, Dept. of Financial Services communication No.F.No.9/21/2006-IR dated 27.07.2007.
xiii. Persons falling in categories (ii), (iii), (iv) and (v) of Point 1.1 should produce a certificate of eligibility issued by the Govt. Of India. xiv. Relevant documents in support of the work experience declared, including appointment letter, salary slip, relieving letter (wherever applicable), etc. xv. Any other relevant documents in support of eligibility. ii. Candidates are required to have a valid personal email ID and Contact No. It should be kept active till completion of this recruitment project. Bank may send call letters for Online test, GD, interview etc. through the registered email ID. In case, a candidate does not have a valid personal email ID, he/she should create his/ her new email ID before applying Online. Under no circumstances, he/she should share/ mention email ID to/ or of any other person. possible/ entertained. Prior to submission of the online application candidates are advised to use the ‘SAVE AND NEXT’ facility to verify the details in the online application form and modify the same if required. No change is permitted after clicking on FINAL SUBMIT button. Visually Impaired candidates will be responsible for carefully verifying/ getting the details filled in, in the online application form properly verified and ensuring that the same are correct prior to submission as no change is possible after submission.